Cebu Pacific Promo Fares 2019 to 2020: Seat Sale For Sep 2016! Seat Sale For Sep 2016! 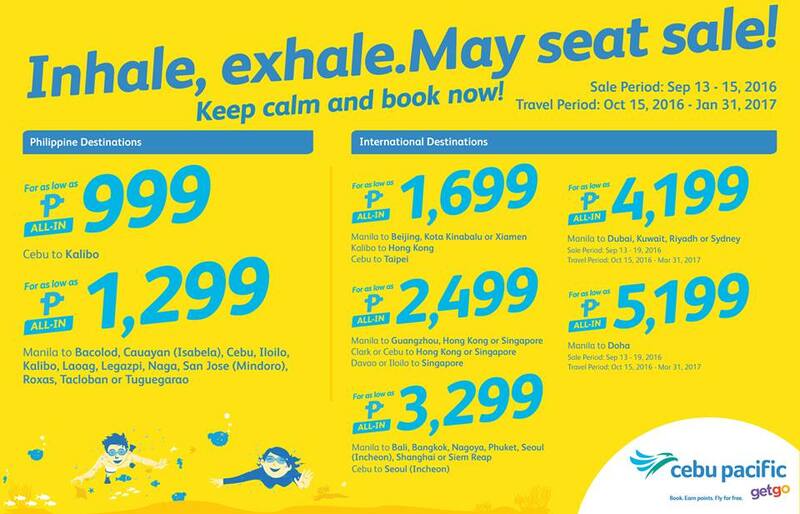 Cebu Pacific Promo Fare 2017: Kalma lang, bes! May seat sale ulit! Keep calm and book now until Sep 15, 2016! You have enough time to mark you calendars and plan trips ahead up to the first month of next year, 2017. There's a seat sale to Kalibo via Cebu in case you may want to bathe in the pristine waters of Boracay beach. If you come from Manila, you can take advantage of the seat sale for as low as P 1299 going to Bacolod, Cauayan (Isabela), Cebu, Iloilo, Kalibo, Laoag, Legazpi, Naga, Roxas, San Jose (Mindoro), Tacloban or Tuguegarao. Take note that Bacolod will have its Masskara Festival come October. For international flights, there is promo for Singapore, Bali, Beijing, Taipei, Hong Kong, etc. Of course, Dubai, Kuwait, Riyadh or Sydney (Australia) are also on special rates. Do check it below. May I know the available flights Manila to Kalibo on Feb 11 and vice versa on Feb 13, 2017? Promo Fares for 2017 is Overwhelming! Promo Fare for as low as P784 from Manila!